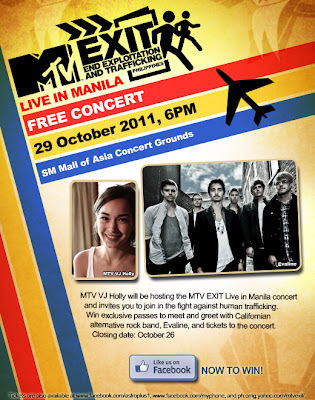 To raise awareness and increase prevention of human trafficking, MTV Networks has joined forces with the United States Agency for International Development (USAID), and the Australian Agency for International Development (AusAID) to hold a concert in Manila this Saturday night at the SM Mall of Asia concert grounds in Pasay City. The free outdoor concert will be headlined by Korean pop sensation Jay Park, previously known as the leader of Korean boy band 2PM. Actor and TV host Dingdong Dantes will also appear as MTV’s newest celebrity ambassador to help spread the word about the MTV EXIT campaign. “As a member of the local entertainment industry, I may become helpful in this campaign by enlightening those Filipinos who are not yet aware of what is happening,” Mr. Dantes said in his speech during the concert’s press conference last week. Mr. Dantes will also host a TV special called Enslaved: An MTV EXIT Special. The 30-minute documentary is the third in a 12-part series that MTV produced in Asia. It will give audiences a glimpse into human trafficking and exploitation in the Philippines, telling the experiences of abuse and exploitation of four human trafficking survivors, and highlighting what everyone can do to help end this crime. Enslaved: An MTV EXIT Special will be aired on Nov. 27, 9:55 p.m. on GMA News TV. Are you going to this event? If so get in touch to do a writeup! Reach us at info@traffickingproject.org.